I continue to find Apple News to be disappointing. It’s like Apple reinvented the RSS reader with less privacy (everything goes through an Apple tracking URL) and a worse user experience (less control over fonts, text that isn’t selectable, no searching within or across stories). So the idea of content that must be accessed from the app — and likely can’t even be opened in Safari — is not attractive to me. Those are among the reasons I deleted Apple News from my iOS devices — Apple won’t let you delete it from the Mac — some time ago. But I downloaded it again yesterday and signed up for the trial subscription to News+ just to check out developments. I found that the problems Tsai mentions are still there, along with what is for me the single greatest deterrent to using Apple News: Apple’s insistence on feeding you clickbaity stories, especially about celebrities, no matter how many times and in how many ways you try to indicate that you don’t want to see them. When you sign up for News+, you get a list of suggested magazine content in a sidebar, and can click/tap a Like button to get stuff from that magazine or a not-Like button to … well, to do what? Because when I tapped the not-Like button next to Vanity Fair I still got stories from Vanity Fair in my feed. And I found this to be true of several other magazines as well. Apple is taking a Facebook-like approach to News: “No, you don’t tell us what you want, we tell you what you want.” So I canceled my subscription after about an hour. Here’s a cool fact for you all to keep in mind: Guess what you see when you look at your RSS reader? Exactly what you chose to subscribe to. Neither less nor more. Now that Apple has announced its next-generation AirPods, I see that I can get a charging pad that will charge the charging case that will charge the earbuds that allow me to play audio on my phone. Or consider wireless charging of phones: It sounds cool, but because the charging is so slow experts recommend that you keep a wired charger around for when you’re in a hurry. Or, alternatively, you could just not buy a wireless charger and accept the additional eight-tenths of a second it takes to plug your phone into a cord. A similar logic applies to the “smart home”: when I finally thought about the amount of time that I have spent trying to get smart lightbulbs to work, and then trying to get them up and running again after a power outage, I realized that the infinitesimal savings of time and energy they provided made them a net drain on my life. Get up and flip a switch on the wall! It’s not hard! And now I’m reading about people who are struggling with the inability to reboot their shoes. It’s not that these products don’t offer benefits, but that the benefits are tiny in comparison to the investment of time/energy/money that you have to make in order to get them and keep them working. I think I’l continue to opt out of most of them. 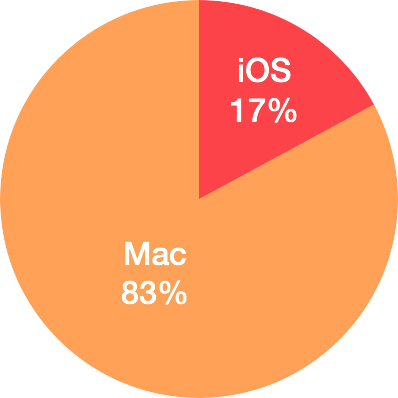 I’ve spent a lot of time in the past year trying to leave the Mac behind and move full-time to iOS. I’ve done this in large part because the many and various problems I’ve had with the last several versions of Mac OS have convinced me that it’s not getting Apple’s best attention, that iOS is likely to be the more reliable platform in the future, and that I’d do well to start adapting my patterns and habits accordingly. Of course, iOS isn’t the only option, and in fact, a couple of years ago I tried to move to Linux. But not only am I pretty heavily invested in the Apple ecosystem, my family members are also, and on Linux I really missed the convenience of sharing apps, answering phone calls on my computer, Messages, FaceTime, etc. So I was gradually sucked back into Cupertino’s orbit. As many, many people have pointed out, text selection has never worked consistently in iOS and has not improved even a little bit over the past few years. And text selection is something I do a lot of. I have often sung the praises of pandoc — it is essential to my work — and there is simply no equivalent of pandoc on iOS. You can do most of the things pandoc does there, but with more steps, more effort, and less consistent results. Mojave has fixed all the problems I had with the previous two or three versions (I’m especially pleased that wifi and Bluetooth both work flawlessly now). On iOS, TextExpander works in some apps; on the Mac, it works everywhere. This is huge for me. I have developed a very large library of TextExpander snippets over the years, and when I’m writing in an app and they don’t work I get weird glitches in my neural software. And I don’t enjoy getting weird glitches in my neural software. So I’m back on a Mac. The WWDC will start in less than a day at this point, and I have no wishlist to share. I used to get excited before this kind of Apple event; now I’m just trepidatious. Once I used to look forward to the next thing Apple would introduce, I used to wonder What are they going to show us? Now I anxiously wonder, What are they going to break this time? The list of things I wish Apple would fix is getting longer and I won’t bore you once again with my complaints, so I’ll condense everything into a single wish — I would like for Apple to reassure me as a long-time user and customer. Reassure me that they have a plan, that they have the most important things under control, that they’re not like one of those motorised toy cars that keep crashing against obstacles at maximum speed, then change direction randomly until they hit the next obstacle, and so forth. I don’t trust this stuff anymore. It was the very reliability of it — in user-friendly design, as well as stability of functionality — that was the basis of my choice in the first place, and continued choices for decades since. I don’t care about the brand itself, and I have no intellectual investment in the platforms as a developer anymore. I just need things that work, and that I can rely on working. I say this with the utmost regret, sadness, and no small sense of betrayal: Apple doesn’t seem to make those things anymore. A Declining Trajectory – Matt Gemmell. Same. 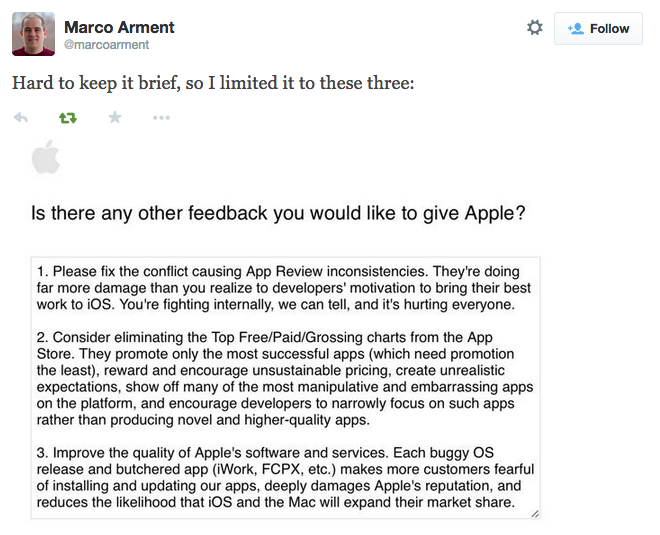 For me, a Mac user who merely dabbles (almost always grumpily) in iOS, this is great news. For the past few years my fear has been that Mac developers would be seduced by the hope of getting the iOS App Store to promote their app, leading to a Flappy Bird-like killing, and in that hope would neglect to make cool and/or useful Mac apps. 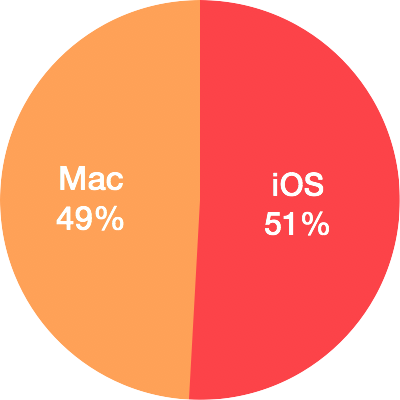 But it seems that, for the really classy developers anyway, the Mac is likely to remain the better option for a steady revenue stream. One of the very oldest Mac apps, and my favorite app in the whole world, BBEdit, will also be yanked from the App Store, for very similar reasons. So it seems that we have a strange situation here: brilliant developers, makers of extraordinarily useful and innovative software, remain deeply devoted to the Mac as a platform, but feel forced to distance themselves from Apple as a company — because that company seems determined to make it harder for them to sell their best products and serve their customers properly. What a crazy world.